I think there is something special about upside-down desserts. I am not sure exactly what is it. Maybe it's the suspense on the time you remove it from the pan (there is always a little hesitation.... is it going to be just perfect? Is it going to fall apart?) Or perhaps it's the fact that you can see the main ingredient right on top, on this case, lemons. These muffins are better served warm, and of course, upside-down. The lemon slice on the top (or bottom?) is edible, but some people might not like it. On this case, it can simply removed. I suggest trying it, the lemons are super sweet and just melt in your mouth. And since this month's challenge from Leila and Cris is about muffins and cupcakes, I am submitting these little guys! Preheat oven to 400'F. 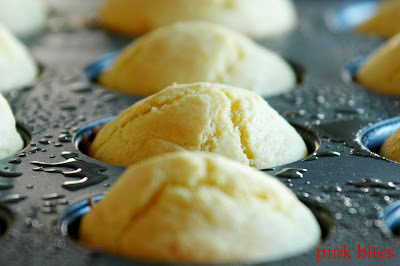 Spray a standard 12 cup muffin pan with cooking spray. Finely grate the zest of the lemons, removing only the bright yellow portion. Set lemons aside. Combine the zest, water and 1/4 cup of the sugar in a small saucepan. Stir over medium heat until sugar is dissolved. Add the butter and stir until it' s melted, about a minute longer. Remove from heat and set aside. Remove all the remaining peel from the lemons (just like you would do with an orange or a grapefruit). Cut crosswise into slices, you will need 12 slices. 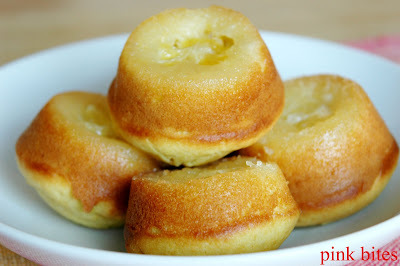 Pour about a teaspoon of the remaining sugar on the bottom of each muffing tin and top it with a slice of lemon. In a larger bowl, whisk together eggs, milk and reserved lemon mixture until smooth. Add the combined dry ingredients and stir just until blended. Spoon batter into muffin tins, bake for about 15-20 minutes. Immediately invert muffin pan into a wire rack and lift it away. Love those upside-down muffins you created!! Lemon is always such a refreshing flavor. Hi Natasha. Welcome to Pink Bites! I am not sure what went wrong, but I think the important thing is to remove all the white part of the lemon before you slice it. Then top them with 1/2 to 1 teaspoon of sugar before you add the batter. It gets really sweet! But it's a lemony kind of sweet taste, kind of like lemon curd, a little sweet, a little tart. And you can always add more sugar to the batter. If you try again, let me know! 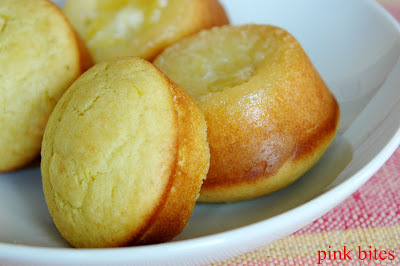 o_O Lemon muffins? OMG lemon muffins! I just made a batch of these and they were amazing! Im gonna go make another 2 dozen for a barbeque!